Still trying to figure out which stocking stuffers to get your husband for Christmas this year? 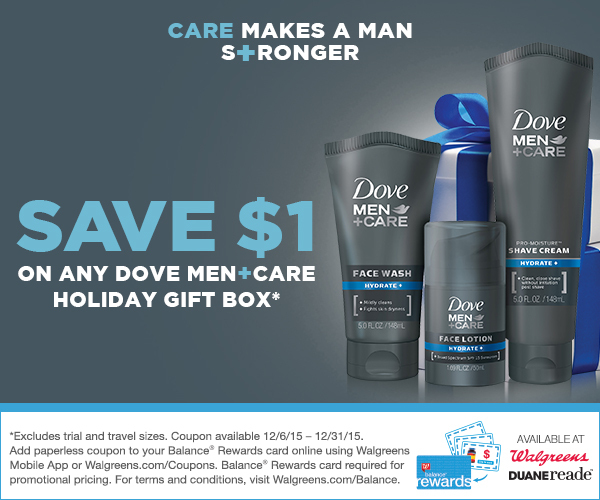 Right now you can save on Dove Men + Care Holiday Gift Boxes at Walgreens. Guys usually need a push to change up (or start up) a skincare routine. What better push than a deal? Pick up a Dove Men + Care Holiday Gift Box that normally costs between $17 and $20, but you can grab it now for $9 with the $1 coupon. They offer two themed box sets, Hydrate and Extra Fresh. Out of those two, surely you’ll find a good mix to help him looking a feeling fresh all season long. Clip the $1 off coupon to your Balance Rewards Card through 12/31/15. -*Excludes trial and travel sizes and gift boxes. Offer good 12/6/15 – 12/12/15. Balance Rewards card required for promotional pricing. For terms and conditions, visit Walgreens.com/Balance. This post is sponsored by Lunchbox, but all opinions are 100% my own.